FREE Skate for Sarah clinic Basics of Inline Skating flat, smoother concrete or asphalt Helmet, wrist guards, knee and elbow pads, Skates with a heel brake. (OSB1) - Beginner 1 Balance, primary skills, protective falling, getting up, basic heel stop , swizzle 1, Y-frame turn 1 (L and R). flat, smoother concrete or asphalt. Helmet, wrist guards, knee and elbow pads, Skates with a heel brake. (OSB2) - Beginner 2 Swizzle 1 and 2, heel stop 2, grass stop, linked Y-frame turns flat to slight slope, smoother concrete or asphalt. Helmet, wrist guards, knee and elbow pads, Skates with a heel brake. (OSB3) - Advanced Beginner 1 1/2 swizzles, one-foot skating, heel stop 3 (quick stops), ski turns 1 (L and R) flat to slight slope, concrete and/or asphalt Helmet, wrist guards, knee and elbow pads, Skates with a heel brake. (TS2) - Trail Skate 2 Apply trail stride, hill skating (up and down) heel pump stop, quick stop, grass stop, three mile trail skate. moderate slopes, recreational trail. helmet, wrist guards, knee pads, skates with a brake, allan wrench tool, water, snack. (TS3) - Trail Skate 3 Heel stop 3, T-drag, slalom ski turns 2, Y-frame turn 2 & 3, up to six mile skate. moderate slopes, recreational trails helmet, wrist guards, knee pads, skates with a brake, skate tools, fluids. (TS4) - Trail Skate 4 Gliding slalom ski turns, minimum distance 6 miles. moderate slopes to steep slopes, recreational trails helmet, wrist guards, knee pads, skates with a brake, skate tools, fluids. 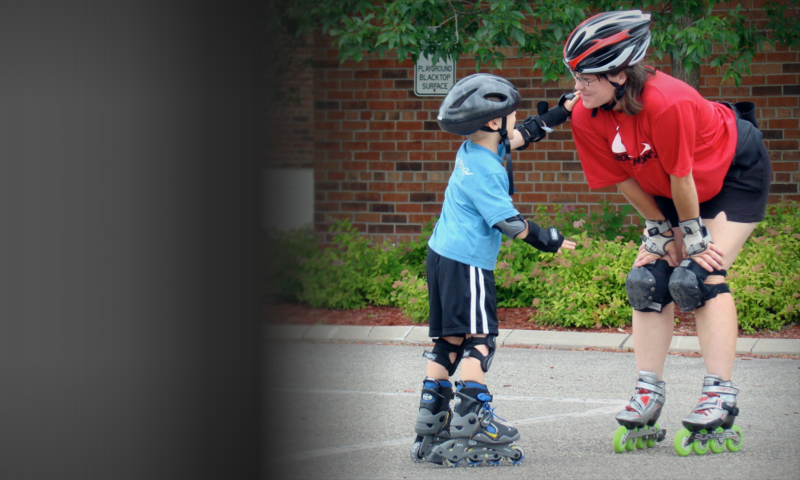 (CM1) - Cool Moves 1 Lunge Turn, Forward Crossover 1 flat to slight slope, smoother concrete or asphalt helmet, wrist guards, skates with or without a brake. (CM2) - Cool Moves 2 Efficient Forward Stride (gear 3), Lunge Stop flat to slight slope helmet, wrist guards, skates with or w/o a brake. two-step turns flat to slight slope. helmet, wrist guards, skates with or w/o a brake. (CM4) - Cool Moves 4 Backwards Turning and F-B and B-F Transitions flat, smoother concrete or asphalt helmet, wrist guards skates with or w/o a brake.